There are jaw crushers and cone crushers for your gypsum mine crushing. SBM also supplies other types of crushing machines for gypsum further processing. SBM crusher varies from large primary jaw crushers and impact crushers to cone crusher and VSI crusher for tertiary and quaternary finishing. SBM will provide you with the right gypsum crusher and usual crusher’s spare parts and wear parts to meet your material reduction requirements. Jaw crusher is used to crush gypsum ore into small size less than 8 mm in the primary crushing process. The vibrating screen screens out the suitable particles into the next step, while the unsuitable go back for the coarse crushing. The secondary crushing process uses hammer crusher or impact crusher to crush gypsum into smaller particles less than 2 mm. 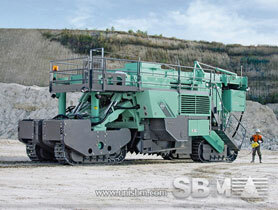 SBM mobile crusher is also widley used in gypsum crushing plant. It is the complete gypsum stone crusher plant. SBM mobile gypsum crusher plant is a small scale gypsum powder manufacturing plant including crushing and screening process. "For gypsum crushing, SBM provides best gypsum crushers and available after-sale support for gypsum crushing plant. "